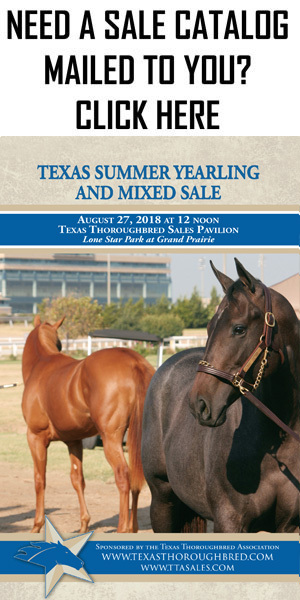 The Texas Thoroughbred Association has announced a catalog of 139 head for its Texas Summer Yearling and Mixed Sale on August 21 at Lone Star Park. There are 102 yearlings in the catalog with a mixed session of 37 head. The catalog is nearly identical in size to last year’s, which offered 105 yearlings and 37 head in the mixed session. This will mark the second yearling sale operated by the Texas Thoroughbred Association after it took over operation of the Texas auctions from Fasig-Tipton. View the online catalog here. Leading Texas sire Too Much Bling is well represented in the sale with 10 yearlings, and there are eight yearlings and three weanlings from the first crops of Texas stallion Moro Tap, a son of Tapit and half brother to Grade 1 winner Ascend. Top regional sires including Custom for Carlos, Grasshopper, Half Ours, My Golden Song and Songandaprayer are represented, as are national prominent stallions Strong Mandate, Graydar, Majesticperfection, Take Charge Indy, Sky Mesa, Stay Thirsty, Liaison and Overanalyze. 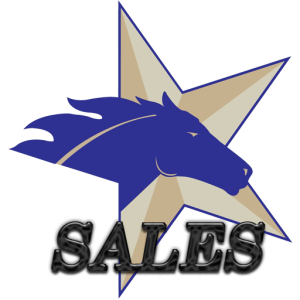 All yearling graduates of this sale will be eligible for the 2018 Texas Thoroughbred Sales Futurity to be run in two divisions at Lone Star Park. The 2017 editions of the race were run on Saturday, and both were won by horses who had been through the Texas Summer Yearling Sale and the Texas 2-Year-Olds in Training Sale. “We are coming off a big weekend for Texas racing as Keene Thoroughbreds’ Texas Chrome, who sold here as a yearling for $10,000, became just the second Texas-bred millionaire in history, and we had two of the best runnings of the Texas Thoroughbred Sales Futurity in many years,” said Mary Ruyle, executive director of the Texas Thoroughbred Association. The $105,600 colts and geldings division went to Galactica, a Texas-bred son of Uncle Abbie who originally sold for just $1,000 as a yearling from Serenity Farm to Thomas Julian and then came back to sell for $52,000 as a 2-year-old from the consignment of Twin Oaks Training Center to Brad Grady and Carl R. Moore Management LLC. Bret Calhoun trains the earner of $79,820 in three starts. Janae, a Louisiana-bred daughter of Closing Argument, took the $97,525 fillies division for owner Susan Moulton and trainer Brandon Jenkins. Janae sold from Benchmark Training Center to Moulton’s Safari Bloodstock for $16,000 as a yearling, and then when consigned by Inside Move as a 2-year-old did not meet her reserve at $35,000. She has now earned $77,123 in four starts. The online sale catalog features photos and videos along with other enhancements, such as the ability for consignors to easily share information about their horses on social media. The sale is still accepting supplements and those will be added to the website. The TTA will hold a New Owners Seminar with a panel of industry experts on Sunday, August 20, from 10:30 a.m. to noon. A Pre-Sale Party is set for that night at 6 p.m. Both events are free to attend and will be held in the Texas Thoroughbred Sales Pavilion.